Bring along your much-loved clothes, make a pattern and get useful tips, techniques and sizing rules. Love a piece of clothing but can't find a pattern? 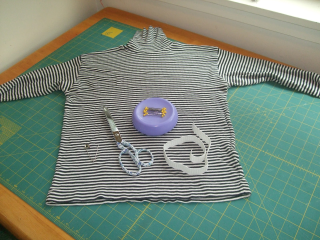 Bring along clothes you want to take patterns off and learn some useful tips and sizing rules. You'll make a pattern for at least one garment and get help on how to get going with others. A list of what else to bring will be sent out when course numbers are confirmed. Tea and coffee provided but bring your lunch. Note: Courses need a minimum number to go ahead so if we don't have enough enrolments a few days before the start date, we have to cancel. We'll let you know by email so please check yours regularly. If you need to cancel your registration, here are our terms and conditions: "What You Need to Know". Basic dressmaking skills essential - you need to be familiar with sewing terms such as seam allowance, straight grain, darts, bias etc.